The green and verdant north-western region of Galicia – just north of Portugal – is an important contributor to Spain’s economy in the fishing, time, mining and wine industries. 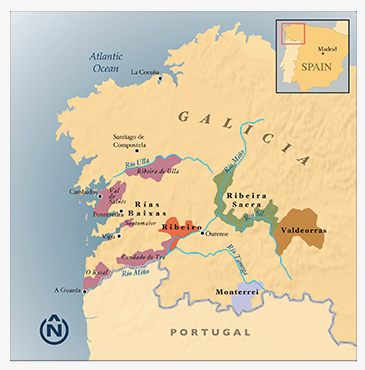 The four wine appellations in this lush nook are Rias Baixas, Ribeiro, Valdeorras, and Monterrei. Although Monterrei is the smallest and least-known of Gallicia, it is quickly emerging as a quality region producing primarily refreshing white and some red wines. Godello almost disappeared from Spain in the 1970’s, but thanks to a few producers who believed in the grape’s potential, a few Godello vines remained planted. It has now seen quite a resurgence in popularity and acreage is growing. 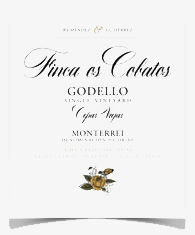 To retain the bright and fruity characteristics of the wine, most Godellos are not aged in oak barrels.